Commercial Insurance Associates (CIA) relocated to approximately 13,000 square feet of office space. 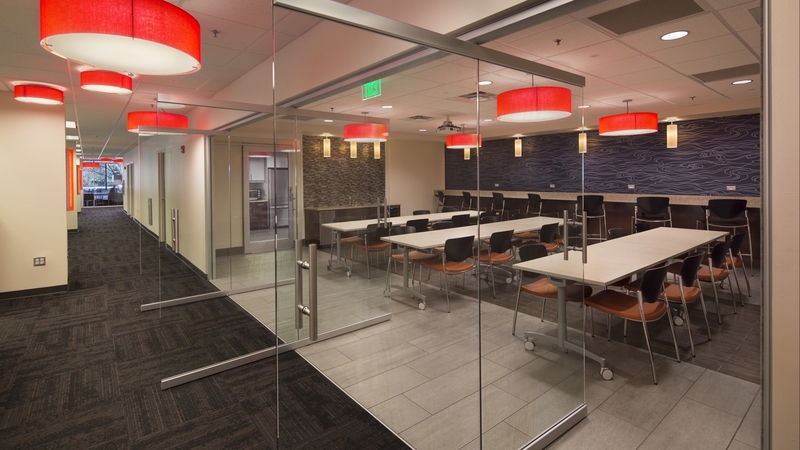 TMP worked closely with CIA to design an effective floor plan adept at meeting the needs of their employees and clients while planning for future growth. To maximize access to natural daylight and views to the outdoors from workstations throughout the entire space, the existing gypsum board walls along the perimeter offices were replaced with floor to ceiling glass fronts with glass sliding doors. The glass walls allow plentiful natural daylight to penetrate the core of the office space while providing necessary privacy. Open work area that accommodates 34 cubicles along with informal gathering nooks for collaborative work. 2 Conference Rooms and a Reception area. Flexible entertaining, dining and training space with large pivoting glass doors and kitchen area.